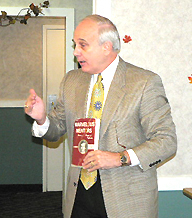 Thomas Lisk, founder of International Speaker’s Bureau, gives a motivational presentation to the Whitehall Area Chamber of Commerce during the Nov. 14 breakfast meeting. He encouraged the attendees to see others for what they can be, become a mentor, and to never treat others negatively. If you want to be a success, "Stop procrastinating!" Thomas Lisk told attendees at the Whitehall Area Chamber of Commerce breakfast Nov. 14. Lisk is founder and owner of International Speaker’s Bureau, has written five books, and won top selling honors twice in two national companies in two different industries before the age of 28. He has been a motivational speaker for 30 years. His newest book, "Idiot’s Guide to Success as a Professional Speaker," will be released in July. He said that one of the secrets to success is having great mentors, and becoming a mentor to others. Staying motivated is crucial, and he pointed out, "Sometimes you will strike out, and find that some don’t want to be your customers." That is why it is important to stay motivated. Time is your most important asset. "Your need a sense of urgency of the value of your time. It is more valuable than your money. You can re-gain money, but not time," offered Lisk. He suggested writing down long-term goals and visualizing them. "You will be amazed what can happen in your life if you visualize it…write down your ideas." He also encouraged seeing others in a positive light as to what they can become rather than treating them in a negative manner. Lisk’s nickname is "Thom Terrific," which was given to him by his mother. He explained that when he was in first grade, he was the child with thick glasses, and the one that the other kids always made fun of, until his mom intervened. She had him watch an episode of "Tom Terrific" with her. Afterwards, she said, "You’re terrific, and don’t let anyone tell you any differently. You’re destined to be Thom Terrific." Lisk had a little fun with his audience by instructing them to tell someone near them, "You’re terrific!" 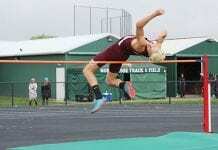 He said, "Now believe that, and make some goals." 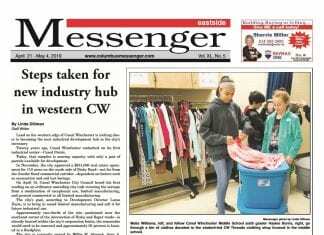 Chamber Executive Director Linda Luft Jones announced that in the past few weeks since she has stepped in as the new director, and thanks to positive media coverage, membership has been increasing weekly. She asked everyone to invite a non-member to join them at a chamber meeting or event so they can see the benefits of membership. She thanked them for their support for her by saying, "I hope this is just the start of good things to come." The board meets each month, while membership meetings and events are every other month. The director is planning her next event to be announced in January. Jones noted that she is still seeking board members, and looking forward to bringing the chamber back to becoming a vital entity in Whitehall and the surrounding business community. Jones can be reached at 237-7792 or by fax at 238-3863. The office is located at 4185 E. Main Street (Rodney Sparks Realty office), mailing address is P.O. Box 13607, Whitehall, OH 43213. Email address is info@whitehallchamber.org, or log on to www.whitehallchamber.org to check out the updated, active web site.